If you have a dog or cat problem, click on Dade County Animal Services for the free county service. Animal Control Miami is a professional, fully licensed and insured, wildlife and pest control company servicing the greater Miami, FL area. We perform all facets of pest control, and specialize in the humane removal of unwanted wildlife from homes and commercial properties. If you have a problem with a wild critter, such as a raccoon in your garbage cans, a squirrel in the attic, a colony of bats in your building, a mouse or rat infestation, or a problem with pigeons, we can take care of the problem. We have over 15 years of experience, and most of our business is referrals from satisfied customers. Give us a call any time, and we are happy to discuss your wildlife problem, offer you a price estimate over the phone, and schedule an appointment, usually same day or next day. Our number is 786-594-1189. We look forward to hearing from you! We operate 24/7, and strive for the highest level of customer service - we show up as scheduled, in clean truck and uniform, and we use the best equipment. We offer a full written guarantee on our work, and provide a full range of services for all of your pest or wildlife control needs. We do wildlife prevention, animal damage repairs, exclusion services, dead animal carcass removal and deodorization, attic restoration, and more. We specialize in bat and bird control, as well as rodent control, but we also excel at removal of wildlife species such as squirrels, raccoons, opossums, armadillos, and any critter that you have a problem with. We put a great deal of care and pride into our work, and make sure that the wildlife problem is gone for good. Wildlife Trapping: Raccoons, armadillos, opossums, we trap and solve the root of the problem: If you have squirrels in your attic, we don't just trap and remove the squirrels. We perform a full inspection of your home and attic, and we find out how the squirrels got in. We check the attic for damage the animals may have caused, such as chewing on electrical wires. We measure the degree of waste the animal has left behind. We humanely remove all of the squirrels, including babies, and completely animal-proof your house, sealing shut any and all areas that animals can use to enter. We repair any damage, and we clean and decontaminate your attic. Rat & Mouse Control: We are experts at rodent control. The big mistake that a lot of other pest control companies make, when it comes to rat & mouse control, is the use of poison. Poison is a completely ineffective approach to rodent control. It only kills a percentage of the rodents, and new ones quickly come in (or are born) to replace the dead ones. The ones that die often do so in the attic or walls, and it creates a terrible odor. The proper approach is to seal off all entry points into the building, and to trap and remove them all. This is the only permanent solution. After we've removed all rats, we clean that attic, so that it is sanitary once more. Miami Bat Control: This is a specialty field. We have a 100% success rate at bat removal projects, and pride ourselves on our precision. We never harm any of the bats - they are valuable creatures, and it's against the law to do so - but we completely remove all of the bats, and seal up your home or building so that no bats can ever enter again, and we give written guarantee on our work. Bat control requires a strong knowledge of bat behavior, and great precision in sealing the tiny gaps that bats can enter. We also provide guano cleanup and removal and decontamination to eliminate health risks associated with bats. Miami Exterminator - We are an extermination company, and we also deal with insects, in addition to animals. Miami Wildlife Trapper - We trap and remove a wide range of wildlife species, such as raccoons, opossums, squirrels, armadillos, groundhogs, chipmunks, armadillos, and even snakes. Dade County Animal Services - If you are looking for the free county service for domestic animals and pets, click the link to the left for the phone number and more information. If you live in certain parts of the United States like South Florida, you have a high likelihood of one or more iguanas coming onto your property or even finding their way into your home. When this happens, you will want to deal with the situation as quickly as possible to limit the damage to your property. Do you want to eliminate the iguanas from your Florida home or property but don�t know how to do it or want to hire other people to do it for you? You want to choose the correct option that leads you to end up with the very best results. At the end of the day, it is all about knowing your needs and choosing the correct trapping method. However, you need to know that the bigger iguanas tend to be very harmful and any means of trying to trap them could lead to injures. The kind of trapping method you use determines the results you will obtain. Will Homeowners Insurance Pay For Wild Animal Damage? What Is a Snare Pole and How to Use it? 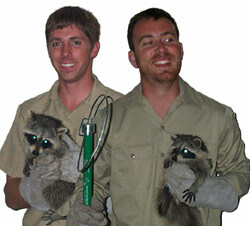 Call us any time at 786-594-1189 and we will solve your Miami FL wildlife problem. We are available 24/7 for a fast appointment.